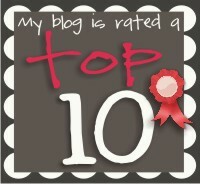 I was so excited to check my e-mail tonight and see that my blog was picked by two different bloggers as a Top 10 Blog!! Thank you so much Laura from First Grade Fundamentals and Ashley from Me and Marie Learning. On to math... We spent the past week skip counting by 2s, 5s, and 10s. The new Core Standard is to count to 120, instead of just 100. This was a bit of a challenge for many of my kiddos-- even though most were very good at counting to 100. We'll keep working throughout the year on counting past 100. I was out 2 days to be a part of the DIBELS testing team. Therefore, I don't have any pictures, but there are several free downloads from the week. We started off on Monday counting by 10s. This was easy for most. I used a 100s chart to give a visual. We discussed that skip counting by 10 is the same as adding 10 (another Core Standard). I used these posters I found at homeschoolcreations.com as another visual. We played the game "I have, who has" and I had parents come to paint the kids' feet. The feet were used to create a giant number line in the hall. I can't believe I didn't take a picture of our finished product. I'll do it tomorrow! Tuesday we focused on the fives. The lesson was very similar. Then each child traced one hand to add to the number line. We also played "I have, who has- counting by 5s"
Wednesday-- you guessed it...we learned how to count by 2's! Again, I got out the 100s chart and discussed adding two. The twos are much harder than the 5s and 10s. We will continue to practice these. Here's the I have Who Has game for counting by 2s. I sent home a letter the week before requesting that each child bring in a pair of cute socks. These were used for the number line. The socks that were brought in were precious! (I don't have a copy of the letter. It was created by a teammate. Each class sent home the letter. The first grade team created one number line upstairs and another one downstairs on our halls). Thursday we reviewed counting by 2s, 5s, and 10s. We used this counting ladder sheet. It turned out to be a little challenging for my kids, but doing it as a whole class helped. I'm sorry I don't remember where I found this page. If it's yours please let me know so I can give you credit. Tuesday- Graphing- Are you a boy or a girl? Click here for the label. Thursday- Problem Solving- Write your first name and last name. How many letters in each? How many letters all together? Which one has the most letters? Which one has the least letters? Click here for the label. I hope everyone has a great, short, week teaching! Having the day off today was SO NEEDED! I feel rested and ready to return tomorrow. Happy Labor Day! Just found your blog and thanks for the great freebies on skip counting! I love 4 day weeks...feel so rested! Stealing your skip counting "I Have, Who Has". Thank you!